The Kendo UI Editor is simple to use and easy to implement. I found it to be a great FreeTextBox replacement, the editor that I’ve used in the past. When using the FreeTextBox HTML editor, the default font styles have to be set in the stylesheet specified in the DesignModeCss property. This entry was posted in ASP.NET, CSS, FreeTextBox and tagged asp.net, css, freetextbox, wysiwyg on December 7, 2012 by Mel. I was able to change the font-family and font size drop down lists, see example below using VB.NET. Note: The list of font sizes available are 1-7, the default is 3. 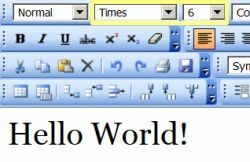 This entry was posted in ASP.NET, FreeTextBox and tagged asp.net, freetextbox, wysiwyg on August 25, 2011 by Mel.